Weather permitting, tonight we will see the moon rise from the east and become 14 percent bigger than usual. No, the moon will not grow bigger instead it will be at its closest point to Earth - what scientists call the perigree. On the average the moon is 383,024 kms away from the Earth. On Sunday, it will be just 356,991 kms away -- or 26,023 kms closer than usual. Science.com says that supermoons occur about once annually, and this year, the supermoon is closer than it has been in a little while. It added that the difference in size can mean as much as a 30 percent change in the brightness, so this will be a particularly bright supermoon. 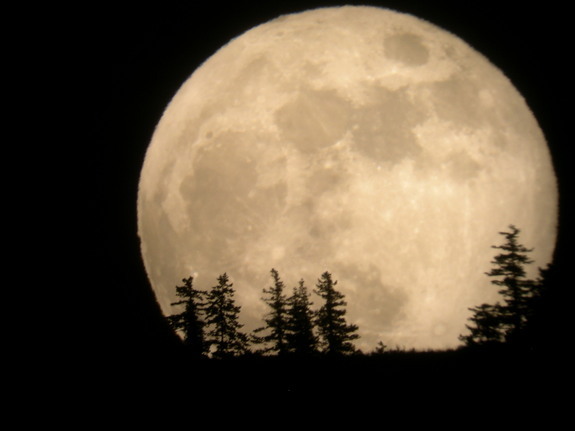 If you want to see the largest full moon of the year, you just need to step outside and look up at the sky, To take pictures of this event, science.com offers the following tips: use a tripod, a zoom lens about 200mm and fast shutter speed. As a final word, let me assure you folks that this event does not portend anything sinister. It will not bring earthquakes or volcanic eruptions. NASA says that the supermoon has very little effect on the tides, that even those who live in coastal areas will not notice any change in the height of water. UPDATE: As expected, it was a cloudy night so the super moon was not visible at all.